Our practice has had the pleasure of utilizing Mountainside Software for 10 years. The staff at Mountainside has done an exemplary job of customizing/updating our templates and handling our help requests in a timely and professional manner. I would recommend Mountainside Software to any outpatient practice. 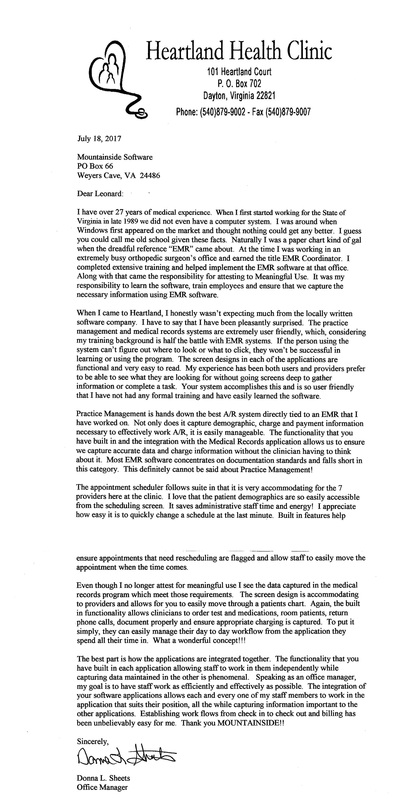 We were one of the first practices to start using Mountainside electronic medical records starting in 1995. Mountainside Software has been with us from the start. The system provides us with an integrated system of medical records, scheduling and billing. Mountainside worked with us to develop macros for our office notes and evaluations. They have provided support and are always available to answer questions and make changes when needed. When we have had problems, they have always been available and helped us to correct the problems quickly, without having to lose time seeing patients. As requirements for medical records and HIPPA laws have evolved, they have been proactive and kept us current. What I like most about the system is that it allows me to access the information from anywhere. If I get an emergency call in the middle of the night or if I am away at a conference, I have full access to the patient’s chart, faxing prescriptions and respond to my patient’s needs.